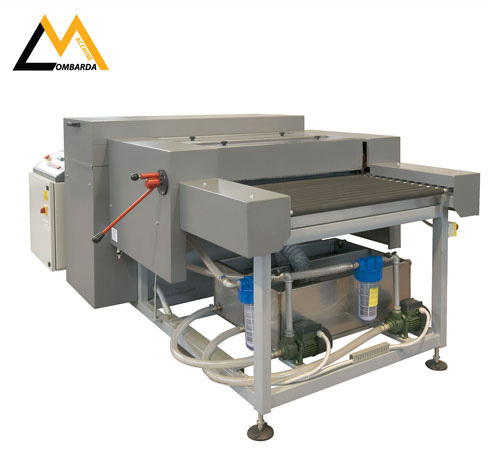 Our washing machines are suitable for small, medium and large glass production. It’s possible to choose between many options, designed for different requirements: 4 or 6 brushes, different workable glass size and glass thickness. The washing machine consists of an entry area, a washing, rinsing and drying zone and an exit area. Glass is transported by means of special rubber rolls mounted on supports with ball bearings. In the washing unit there are 2/3 cylindrical brushes front (or lower) and e 2/3 cylindrical brushes rear (or upper), sprinkled with water recycled by a pump with self-contained closed circuit tank. Our washing machines can be combined to grinding machines and vertical driller, to straight edging machines or used for general edge wash, with possibility to have special charateristic following customers requirements.